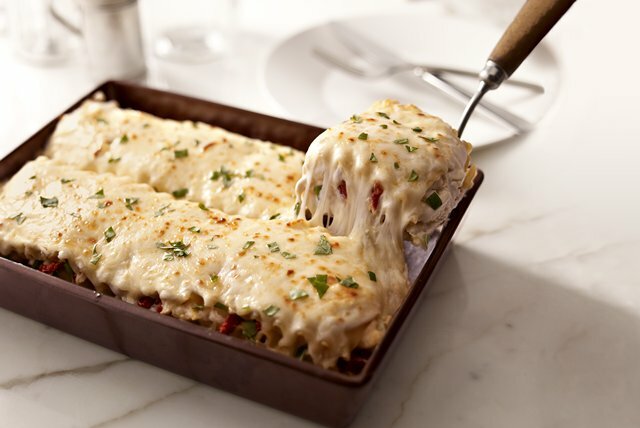 Watch this video to see how to take ordinary lasagna to a whole new level. Hint: It includes tender chicken, artichoke hearts and a creamy white sauce! Combine chicken, artichokes, 1 cup mozzarella, Parmesan and tomatoes. Beat cream cheese, milk and garlic powder with mixer until blended; stir in 2 Tbsp. basil. Reserve half; mix remaining half with the chicken mixture. Spread half of the remaining cream cheese mixture onto bottom of 13x9-inch baking dish; cover with 3 noodles and 1/3 of the chicken mixture. Repeat layers of noodles and chicken mixture twice. Top with remaining noodles, cream cheese mixture and mozzarella; cover. Serve with your favorite hot steamed vegetable. Spray the foil with cooking spray before using to cover the lasagna to help prevent the foil from sticking to the cheese on top of the lasagna.